Sometimes to go forward, you need a little pushback. 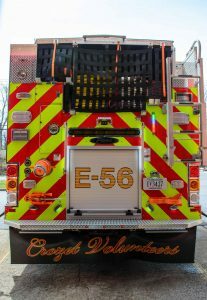 On Sunday, April 15, at 2:00 p.m., the public is invited to the Crozet Volunteer Fire Department’s dedication and pushback of their new E-56 pumper at the station. Albemarle County Supervisor Ann Malleck will pay tribute to those who contributed time and effort. Refreshments will be served. Oh, and what’s a pushback? 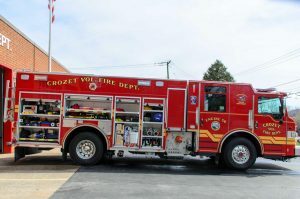 Thanks to funding from Albemarle County and the sale of Crozet’s 20-year-old engine to another fire department out of state, the brand-new, $800,000 truck joins the CVFD’s fleet as its primary vehicle. 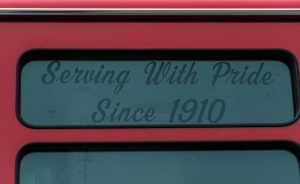 It was customized by a poll among the department’s membership and discussion by its truck committee (Preston Gentry, Will Schmertzler, Mitch Fitzgerald, Mike Boyle, Chas Sandridge, and Butch Snead) for almost two years. The truck, classified as a pumper, carries 801 gallons of water, more than any other CVFD vehicle. It’s stocked with a large diameter hose and small diameter attack lines, making it extremely versatile. They are also stored lower than in many trucks, creating faster access and less fatigue for the crews. Careful thought went into other features. The handles for the six pumps are laid out on the control panel in the same orientation–front of vehicle to back–as the actual pumps. Hose clamps are colored orange–CVFD’s designated color–so they can all be recovered after a multi-company call. A large mudflap, emblazoned with “Crozet Volunteers,” keeps the back clean. There’s even a small refrigerator to hold cold water for long, hot calls. 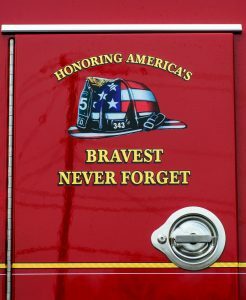 Finally, unique to the CVFD, is the “Crozet” cutout in the front fender. It lights up white at night and in red when the emergency lights are on. 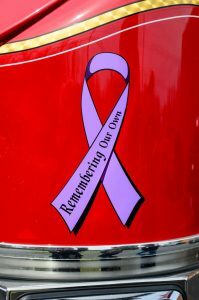 For more information on the dedication and pushback, call the CVFD at 434-823-4758 or visit their Facebook page at facebook.com/crozetvfd.